Urban Beach is pleased to announce the signing of South African born surfer, trainer and model Tehillah McGuinness. Having been born and raised in South Africa, Tehillah was lucky enough to have lived right on the doorstep of one of SA’s best surf spots J-Bay. Tee leads an incredibly busy and active lifestyle, balancing her time between modelling, training celebrities and touring with her surf and fitness weekends, as well as running her own business Ohana Fitness & Surf. Of course she still manages to spend time doing what she loves the most, getting out into the waves. This newest partnership will see Tee and Urban Beach working together to ensure that the clothing we design is ready for any adventure. Tee has recently been kitted out with all of the Urban Beach Autumn/Winter 2014 favourites which you can take a look at here. We had a little catch up with Tee so you guys can get to know her a little better. Tee: Depending on if I am coaching or not I like to wake up early and get the most out of the day (although I really do love to sleep). If I am teaching then I try to always get a surf in after or at least some form of training. If there are no lessons then it’s all about getting a morning and evening surf in depending on conditions. There is usually some form of training involved as well as working on projects. I know 'Island life and the word 'busy' don't seem to fit together but my days just seem to be so full at the moment- between coaching, surfing myself, training and trying work on my projects/trips etc. for the year I sometimes can’t believe how fast the days go. UB: What do you like to do when you’re not surfing/modelling/coaching? Tee: RELAX! Haha! I do like to keep busy and there are always lots of beautiful places you can see here. From volcano climbing, to bike riding along some picturesque routes or just walking in the sand dunes to totally disconnect for a while always makes me feel rejuvenated and ready for the next challenge. Things can get pretty hectic and I find when I do these things it helps me not to feel so overwhelmed and appreciate what I have worked towards and have. UB: What do you eat for breakfast? Tee: My favourite at the moment is natural Greek yogurt, with a mixture of raisins, chopped banana and almonds. If I am coaching then I eat warm oats with honey and almonds. When I have a bit more time, (to eat a leisurely breakfast) I love to make poached eggs with wholegrain toast and fresh spinach. Oh and coffee...does coffee count as breakfast!?? UB: Where is your favourite place to be? UB: What is the next adventure on your list? UB: Do you have a life motto/a quote you live by? Tee: Something my mom told me from a young age - 'You create your own happiness and destiny.' She always told me to dream big, that nothing was impossible and never wish to be someone else, to be unique. Some of these things I never really fully understood the true meaning of until these last few years and those words could not be any truer. UB: What is your biggest success up until now? Tee: Personally, I would have to say starting my own business 'Ohana Fitness and Surf' as well as shooting a few commercials this year. UB: What does your perfect day look like? Tee: Hmmm... waking up to perfect fun waves somewhere tropical with my family. A fun family surf followed by a big breakfast, and then spending the rest of the day exploring! UB: What is your biggest tip to someone trying to keep fit & healthy? Tee: NUMBER 1 - Stop buying beauty magazines! ;) haha. Don't put too much pressure on yourself - set realistic goals and stick to them. When you reach your first goal (no matter how small you think it is) do something to reward yourself, and continue this pattern until you reach the final goal. Find a sport or exercise that you love, there is nothing worse than doing something you hate. It all starts in the mind...so always think positive thoughts and believe you can do whatever you put your mind to - even just working out 3 times a week! :) Most importantly have fun and listen to your body! UB: What has been your biggest challenge? Tee: My most recent challenge would definitely be when I had chronic tendinitis on both knees and I could barely walk. I was out of the water for 5 months on and off. I was given so many different opinions and advice, which slowed down the healing process. This happened in the beginning of autumn one year and the waves were amazing here...It was complete torture. I am nearly 100% but am definitely more careful and aware of looking after my body. UB: Anything else you’d like to tell us? 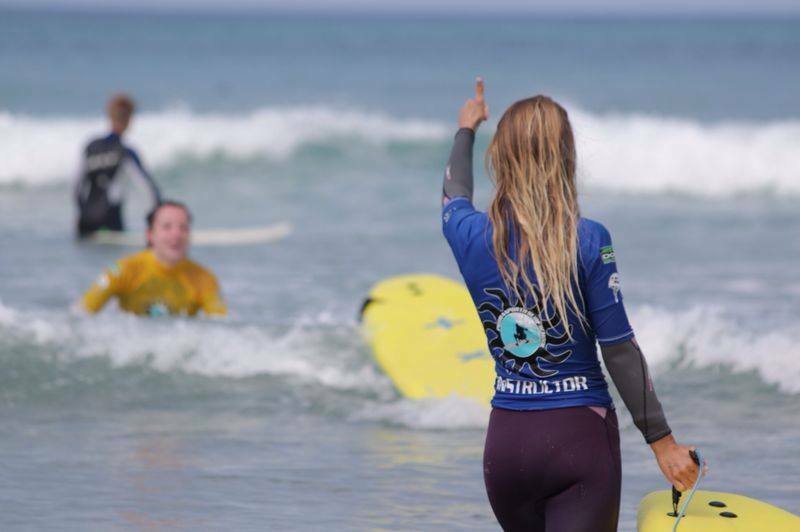 Tee: I'm going to be running a series of Girls Surf and Fitness weekends around Cornwall this year for all levels and ages so make sure to keep an eye out for dates! See Tee's website here.